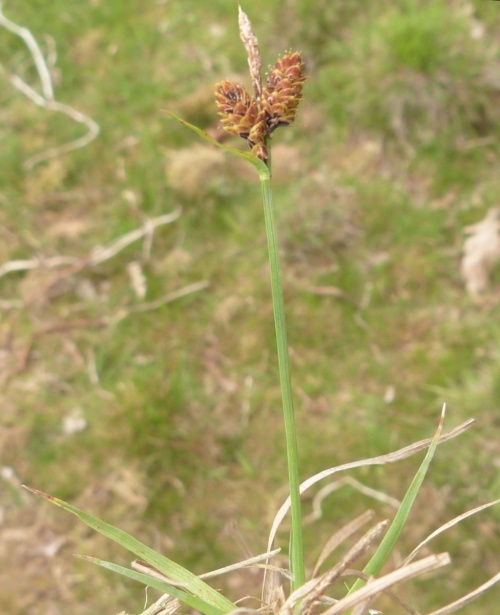 Carex nigra has rhizomes, normally far creeping, producing at intervals shoots in small or large tufts. Stems are 7 to 70 cm tall, rough, slender and three sided, and bear leaves normally 1 to 3 mm wide, flat, tapered to fine points, glaucous and mostly erect. Inflorescence has leaf like bracts, the lowest about as long as the inflorescence. 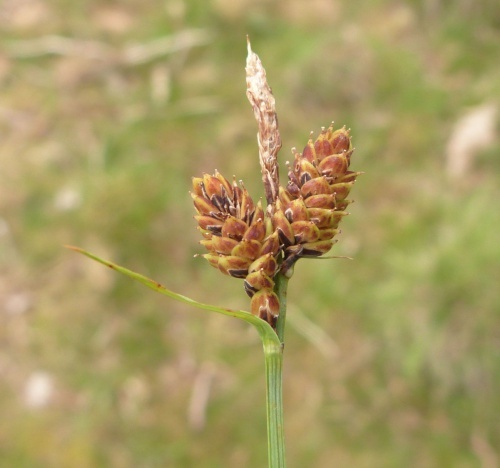 Female spikelets 1 to 4, wide, close together and usually stalkless. Glumes are oblong to oval, usually blunt, black with green midrib, the fruit is, wider than the glume, faint ribbed and often with a purple tinge and almost no beak. Male spike purplish brown. Wet places, marshes, bogs, wet ditches etc. Fairly frequent in Leicestershire and Rutland. In the 1979 Flora survey of Leicestershire it was found in 73 of the 617 tetrads.